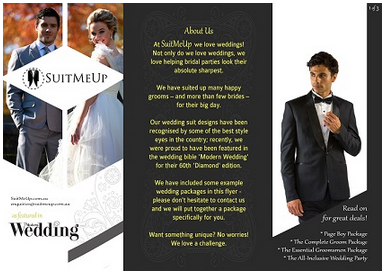 At SuitMeUp, we pride ourselves on making you look your best for any occasion. Your wedding is one of the most special occasions of all – and our wedding suits are sure to have you feeling and looking your best on your big day. We know this photo is huge, but we really like it. We can tailor your bespoke wedding suit from a range of styles, or you can design your own, with all the fine details and adornments that make up your ideal suit or tuxedo. We have a number of package options to ensure your wedding party looks great, while saving money at the same time. Our packages range from the single groom package to full wedding parties of any size. Or we can always customise a unique package to suit you. Please click the image below to check out our downloadable PDF flyer for the latest package deals (opens in new tab). 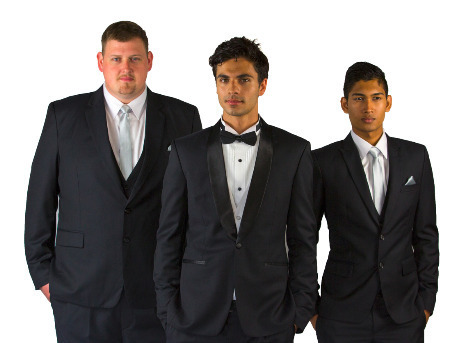 SuitMeUp was invited by the organisers of the 2014 Sydney Bridal Expo to provide two morning suits for their main fashion parade. Our suits took centre stage in the ‘Downton Abbey’ segment of the show, with the models Mark and Stephen surrounded by a bevy of jewel-adorned beauties in the classic Edwardian style of the 1920s. For the show we manufactured two very special suits; for Mark, we made an all smokey-grey fabric with a flowing tail and classic double-breasted waistcoat. For Stephen, we made the absolute classic ‘House of Windsor’ morning suit, with dark grey herringbone pants, light grey waistcoat and a charcoal morning jacket. It was so great to receive such fabulous feedback from the attendees and other exhibitors at the show, repeatedly told that the ‘Downton Abbey’ segment was the highlight of the whole weekend. Thanks to you all – we had a great time! 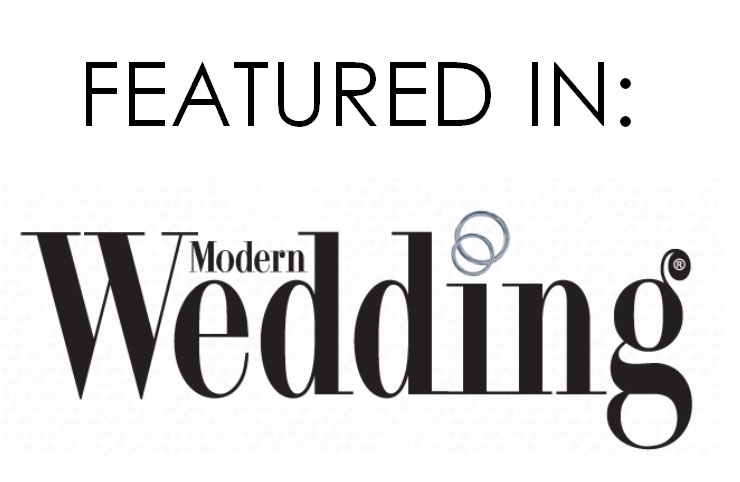 Please click here to take a closer look at our wedding suits in our Formal Suit Gallery. Any questions you’d like answered? Please don’t hesitate to Contact Us.